A Focus Mission is one that the Mission Crew will intentionally highlight in church communications and regularly invite the congregation to actively engage through events and activities. Learn more about Focus Mission Partners at Fellowship here. This videos share the experiences of some volunteers who have participated with our Nicaragua Mission Partners. For more information, contact Emily Rosendahl or Pastor Nate. Kids Hope USA develops one-on-one relationships through the creation of church-school partnerships that pair church members with at-risk kids in supportive, mentoring relationships. Fellowship has been the Kids Hope partner with Lakewood Elementary School since 1997. Below is a video commemorating 20 years of Kids Hope at Fellowship. Kids Hope USA mentors spend one hour per week, reading, talking, playing, and listening to a child at school. By helping the child feel loved and valued, they help that child to learn, grow, and succeed. Although the majority of student referrals for participation in Kids Hope are made by teachers and/or the school principal, parents may request participation. Church members over the age of 16 who can read are eligible to participate in the program as a mentor or prayer partner. Mentors are interviewed by Karen Donker, Program Director of Kids Hope USA, and must agree to have a police background check. Training, supervision, and affirmation for all volunteers are also provided. If you have any questions please, contact Karen Donker. 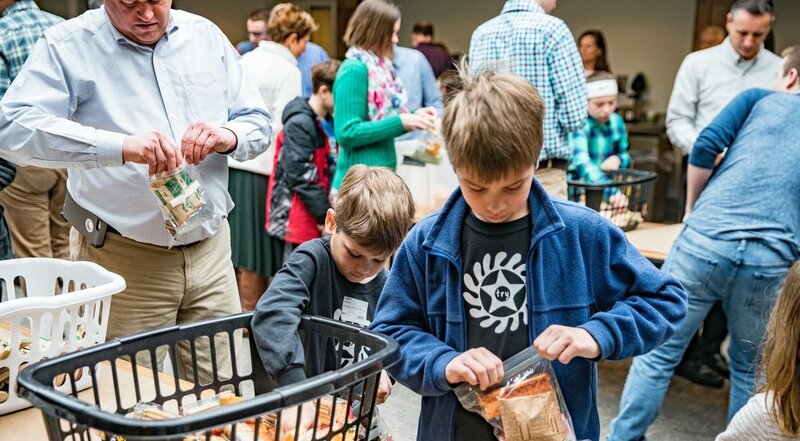 Hand2Hand Ministries is a resource for children facing hunger over the weekend. Healthy food is provided for these children, so they have a greater opportunity to succeed academically, emotionally, and physically. This is done by placing a backpack of food in the child's locker for them to take home on Fridays. Students are responsible for returning the empty backpack to their lockers on Monday morning so they can be collected and packed for redistribution on Friday. Hand2Hand Ministries is supported through individual donations from members of the congregation at Fellowship Reformed Church, various groups and businesses within the community, and Hungry for Christ Food Ministry, located in Hamilton. Food items included in Hand2Hand backpacks are child friendly, nonperishable, and preferably vitamin fortified (boxed or canned food, granola bars, juice boxes, cheese and crackers, cereal, etc.). It is important to note that Hand2Hand is not meant to feed a family for the entire weekend, but is meant to provide supplemental food. Your donations are needed and appreciated. Thank you! For a complete list of our Local, Regional, & International Mission Partners please click here. If you'd like to be considered for our Mission Partners, please click here. Be a part of the support network that encourages our global mission partners through emails, care packages, and providing hospitality when global partners visit. Contact Pastor Nate.